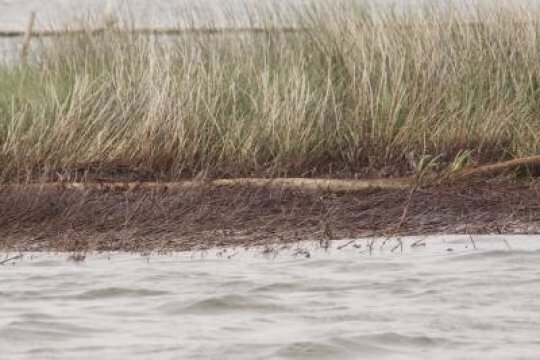 The Deepwater Horizon oil spill six years ago caused widespread marsh erosion that may be permanent in some places, according to a new Duke University-led analysis of 270 miles of the Louisiana, Mississippi and Alabama coasts. Oil from the 2010 Deepwater Horizon spill in the Gulf of Mexico killed marsh grasses where it washed ashore in Louisiana’s Barataria Bay. At the hardest-hit of 103 Natural Resource Damage Assessment (NRDA) sites, where oil covered more than 90 percent of plants’ stems, widespread die-off of grasses at the marsh edge occurred, followed by up to two years of accelerated erosion as dying plant roots lost their grip on marsh soil. Erosion rates at these heavily oiled sites were between 1.4 and 1.6 meters per year higher than scientists had expected, based on findings from similar areas that weren’t hit with oil. The April 20, 2010 explosion on the Deepwater Horizon offshore oil rig killed 11 workers and pumped more than 100 million gallons of crude oil into the northern Gulf of Mexico, making it the worst environmental disaster of its kind in U.S. history. “Marshes that experienced elevated erosion due to high levels of oiling didn’t recover; they’re now gone, having been converted to mudflats in the shallow underwater environment of the Gulf,” said Brian R. Silliman, Rachel Carson Associate Professor of Marine Conservation Biology at Duke’s Nicholas School of the Environment, who led the new large-scale analysis. The outlook is more optimistic for marshes where oil covered less than 90 percent of plant stems. The team’s research, published Sept. 27 in the peer-reviewed journal Nature Scientific Reports, is the first empirical study to identify the threshold at which spill-induced marsh erosion occurred across a large geographic area. They used data collected as part of the NRDA, which was conducted by state and federal Natural Resource Trustees in the aftermath of the Deepwater Horizon spill. Various sources have estimated that between 60 and 100 linear kilometers of salt marsh experienced plant stem oiling above the 90 percent threshold because of the Deepwater Horizon spill. “Our analysis reveals that accelerated erosion, and likely land loss, occurred in these areas,” Silliman said. Most of the erosion occurred within one to two years after the spill, he noted. Once the erosion front — created by the black belt of oil that layered over and killed grass on the marsh edge — ran into healthy vegetation farther back, the land loss due to erosion slowed. The new findings corroborate an earlier study led by Silliman that showed elevated erosion at a limited number of heavily oiled sites. They also support studies led by Mark Hester and Jonathan Willis at the University of Louisiana’s Institute for Coastal and Water Research, which found that there was widespread die-back of marsh plants at these sites. Web Source: Materials provided by Duke University.